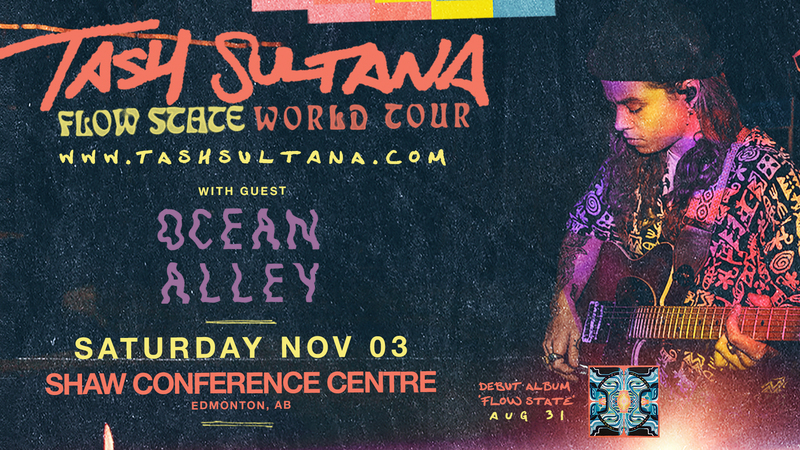 Global sensation Tash Sultana returns to capture the hearts of Edmontonians on November 3rd! Tash will light up our stage in celebration of the Flow State World Tour! Catch Tash live with guests Ocean Alley at Edmonton’s downtown event destination! Tash Sultana is a young, dynamic artist who has commanded world attention with homemade videos that went viral. A true virtuoso, Tash soon sold-out major theatres and arenas globally, and played at the world’s biggest festivals – no mean feat for an artist who just a year before recorded songs on a go pro in a bedroom. Since Tash’s grandfather gifted a guitar at the age of three, the self-taught artist quickly developed a unique style that has people lined up around the world. Tash has mastered over 15 instruments, with vocals that shine with a magical quality and a live show that needs to be seen to be believed. Recent accolades include over 200M streams of the Notion EP, topping the iTunes chart in multiple countries, ‘Jungle’ coming in at #3 in triple j’s Hottest 100, achieving gold sales for the Notion EP and platinum sales for single ‘Jungle’ which also featured in FIFA 18, winning the prestigious unearthed j award, 4x Aria award nominations, multiple APRA nominations and most recently playing stand out sets at Coachella, Lollapalooza and Edmonton Folk Music Festival 2018. On August 31 Tash’s highly anticipated debut album, ‘Flow State’ will be released with the album’s key singles, ‘Salvation’ and ‘Harvest Love’ out now. Tickets (incl. GST) $39.50 (plus service fees).